If the cities are condensed, too often the green must go. 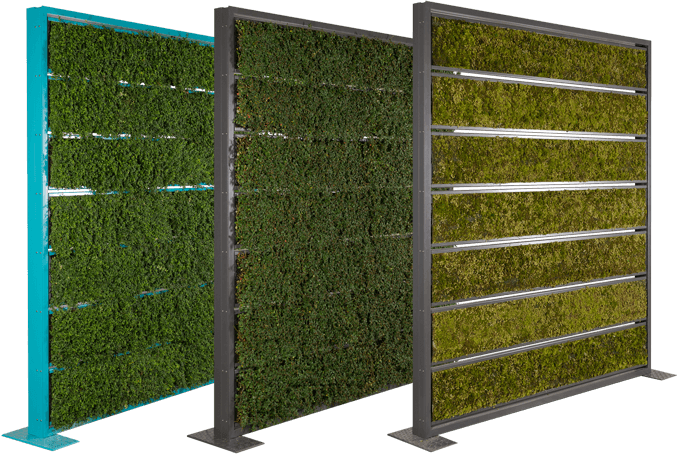 cityLam System Greening solves this competition between technology and nature. cityLam brings the nature back to the city. Whether it be public buildings, industrial buildings, schools, gymnasiums, hospitals, railway stations or private homes. Growth and naturalness are no longer a contradiction. With the installation of the modules, façades become greener, more beautiful and more climate-friendly. If cities are growing, nature grows with cityLam. By planting undemanding and easy-care plants such as sedum, cotoneaster, or mosses, the cityLam System Greening can be installed even in extremely cold or hot regions. Upon request, an automatic irrigation is possible. In the mobile version, the modules can be used in hot regions as a window replacement. The evaporative cooling plant produces cooling effects that improve the indoor air quality naturally. cityLam system greening is fine dust binding and improves the carbon footprint. The facades get a natural thermal cooling and noise reduction. They can also be used as ecological compensation areas due to the planting.